Bigelow Herbal Tea is another very popular brand. This stuff is easily found in any grocery store or online. If you were to compare it to another brand, it would be Celestial Seasonings. Bigelow Herbal Tea currently has a 4.4 star rating on Amazon, and is among the best store brands out there. So, let's dive in and see why it is so great. Because different teas can help with different situations, it is always a great idea to grab a variety pack. 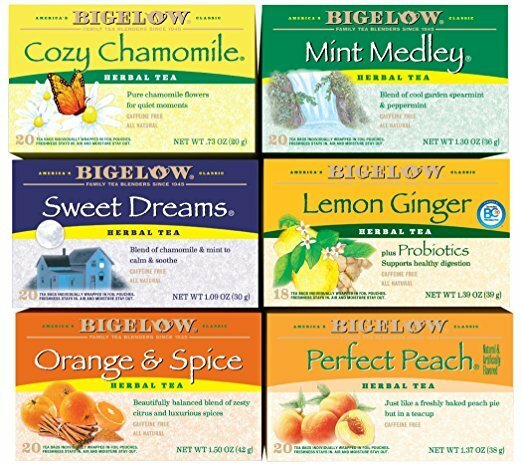 Bigelow Herbal Tea variety pack offers 6 of their most popular flavors. The majority of the teas are made with all natural ingredients, and no artificial additives. I am actually very fond of this tea and currently have this exact box in my cupboard. So from personal experience I can say that this tea is not only delicious, but the variety pack offers a great selection to choose from. Now, not every single tea is 100% natural. Some of the teas, like the Perfect Peach, are forced to take the help of artificial flavors to perfect their peach flavor. Since peach is not a flower, it is harder to get that peach flavor, without using an artificial flavor's help. Now, that is the only tea in the variety pack that uses artificial flavoring, so you can easily avoid that selection if you would like. Herbal teas in general have a lot of great benefits to them. Regardless of the type of herbal tea you are drinking, there are somethings that you will be take advantage of. One benefit that you will get from all tea is weight loss. Now, this is not like the tea will burn off fat. Rather, the best herbal tea will remove water retention, so you will visibly look slimmer because you will lose a lot of your excess water weight. Another great thing about herbal tea is that you get a access to a wide variety of antioxidants, vitamins, minerals, and other nutrients. Because herbal tea often features a combination of herbs, you are able to take in a variety of great things that can be highly beneficial to your body. Other common health benefits of the best herbal tea include relaxing the body and mind, aiding in sleep disorders, reducing inflammation, easing various pains, protecting against common diseases like the cold or flu, boosting immune system, regulating the digestive system, and stimulating cognitive function. Bigelow Herbal Tea are great at boosting your immune system. The rosehips and various fruit herbs they include contain a lot of antioxidants and vitamin C, which is sure to give your body the boost it needs. While no product is perfect, Bigelow Herbal Tea gets really close. There is a reason that Bigelow is one of the most popular herbal tea brands on the market. They are not only inexpensive, but they actually deliver very well. The sampler doesn't just give you a selection of various teas. This variety pack gives you 6 boxes, with a total of 118 tea bags. This gives you the opportunity to try out whichever flavor you want and keeps the experience fresh in the meantime. Plus, it allows you to try out a bunch of different flavors, so you can find a favorite. Or you can just stick with the various variety packs they offer. Pretty much, the only downside I could find for this product was that not every single tea is 100% natural. There are a select few that use artificial flavoring. However, the only tea that uses artificial flavors in this pack is the Peach. So if you like, it is easily avoidable. Bigelow is a family owned tea business that has been in business since 1945. The company has never been owned by anyone other than the Bigelow family and they all would like to keep it that way. Their goal is to provide a quality tea that you can be proud and comfortable drinking. The majority of their tea do not use artificial additives or preservatives, and most of them, if not all, are also kosher as well. The Bigelow brand has various other brands under their belt now, including Benefits, Novus, and Charleston Tea Plantation. Their product line is very expansive and all feature the same great quality and their original products. The variety pack gives you a wide selection that is sure to last you quite a while. Rosehips and the various other herbs Bigelow Herbal Tea include in their tea are great for boosting your immune system. You can find this tea in nearly any grocery store. Which is great if ordering tea online is not your.....cup of tea. Not every tea flavor is 100% natural. Bigelow Herbal Tea offers great quality ingredients with a wonderful selection of flavor. It is great for those who are constantly switching between teas, or just want a different selection to match the occasion. This variety pack offers an impressive selection, even though one of their options does contain artificial flavor. Nevertheless, the others are packed full of great and beneficial ingredients, one even infused with probiotics, which help digestion. Overall, Bigelow Herbal Tea is a great brand that you will not regret buying from. Their ingredients are high quality and offer some great health benefits. If you want to try them out for yourself, you can grab the sampler for $19.89. For more information about the best herbal tea, check out the rest of Green and Growing. Here are some top questions that I found for people seriously considering buying the Bigelow Herbal Tea Variety Pack. Is this tea organic? Unfortunately no, there are no organic ingredients. But they are all natural. Are the tea bags individually wrapped? Yes, they are. Hey, I'm Pat. I am a Millersville grad with a Bachelors of Arts in English. I love to write, play video games, watch movies and TV, basically be a total nerd whenever I can. Green and Growing is important to me because it allows me to help others be as green and eco-friendly as possible. With Climate Change being what it is, it is even more important for people to get educated about their environment. This website allows me to do my part in that. Also, I'm a huge goof who tries to add some humor into anything I write. Stay Excellent out there!